This past week has been very difficult for a great many people in this country and around the globe. For those of you who fall on either side of the issues, it is vitally important that we be able to maintain an open dialogue with each other. To that end, I have selected 2 games that I think deal with some very serious issues and would be a great place to start having conversations about topics like surveillance and the value of a free press. Games have the ability to put us into someone else's shoes in a way that other forms of media cannot. I personally believe that games can be an incredible force for change in this world if for no other reason than they allow people to look at an issue from another perspective that they might not have otherwise been able to imagine. If you are interested in seeing things from another perspective, I submit the following to you. 1) The Westport Independent: We've talked a little bit about this game before. I first played it at PAX in 2015. At first glance it comes off as a sequel to Papers, Please, but it is a completely unrelated project. In the Westport Independent, you play as the editor of a newspaper in a country recently come under a new, dictatorial regime. This regime hopes to control the press entirely and is not above forcing it to conform to their ideals. Your job is to decide how your paper will proceed; what stories will you highlight, and how will you portray the events that unfold. At its heart, this is a game about censorship and free press. 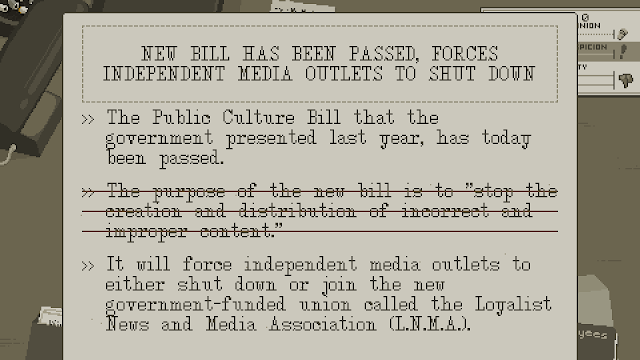 A central mechanic of the game involves assembling the headlines that will appear in each issue. Part of that process involves editing the stories that your other writers submit. By reworking them to be less inflammatory, you may spare them from government scrutiny, but find that they refuse to work with you in the future. Trying to keep a full staff is difficult, especially on top of trying to keep them all safe. You find yourself wanting to publish the truth and stick it to the oppressive government but that sentiment is often at odds with your desire to keep your staff from being arrested, beaten or worse. The Westport Independent shows us the value of our free press in a time when that incredible facet of our country is divided and taken for granted. 2) Orwell: Let's be frank. The world we live in today thrives through information. We all like to think that our right to privacy is incontrovertible, but there are a number of programs out there that allow agencies to watch and listen to you all without your knowledge. Government surveillance is a hot topic and ultimately a divisive one. 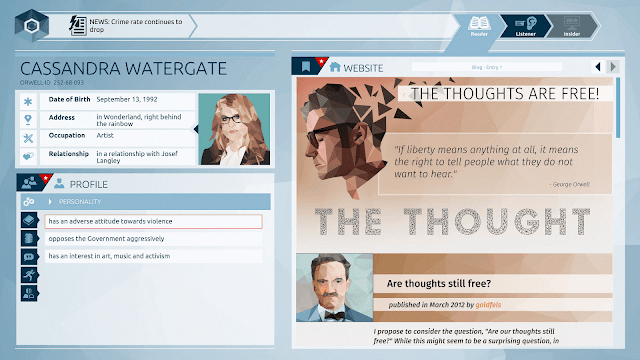 Orwell is a game that thrusts the player right into the heart of the issue. In the wake of a terrorist attack on a public square, the player is recruited as a surveillance agent tasked with trying to find the perpetrator. In the interest of finding evidence, the player digs through the personal information of numerous people. Looking through social media info, finding records among news sites, listening to chat conversations, anything that could lead to a break in the investigation. The player is in control of what information is collected, as some of it conflicts with other pieces. In these moments, a gut decision can change the outlook of the entire investigation and have a serious effect on the direction that the investigation goes. For as careful as any player may think they are being, it is still quite easy to get things wrong and find yourself looking for a smoking gun among the personal details and conversations of a person that hasn't even been charged with anything. It becomes clear just how much just the assumption of guilt can cloud someone's judgement, especially when dealing with something like terrorism. It is only by opening ourselves to the experience of others that we can begin to fathom the depth of our own environment. It can be quite difficult to have those conversations with people in a way that doesn't leave a bad taste in your mouth. In order to get the whole story for any issue, you have to be willing to see it from as many angles as possible. I hope that these games can help broaden those horizons for some of you. I certainly think they did so for me.